A young school teacher is posted to a remote Aboriginal community, and through his experiences, his encounter with the local people, his discovery of the history of the community, his own history and his Aboriginality are revealed." 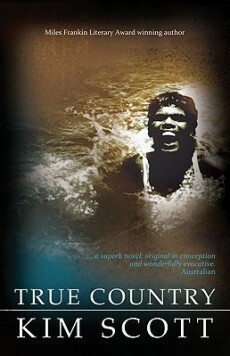 "Like many others in the novel, Billy is struggling to find a meaningful cultural identity and to create a better future from the wreckage ofA young school teacher is posted to a remote Aboriginal community, and through his experiences, his encounter with the local people, his discovery of the history of the community, his own history and his Aboriginality are revealed." "Like many others in the novel, Billy is struggling to find a meaningful cultural identity and to create a better future from the wreckage of the recent history of Aboriginal people. What he finds at Karnama is a disintegrating community, characterised by government handouts, alcoholism, wife-beating, petrol-sniffing and an indifference to traditional beliefs and practices. It is a depressingly familiar litany of social problems which confirms the smug racial stereotypes of the white community to which Billy initially belongs." "True Country offers no clear-cut solution to the realities of powerlessness. What it leaves us with is Billy's vision of the 'true country' which he shares with the unnamed Aboriginal narrator in the final pages of the novel. Gorgeous language. I love Scott's use of both Noongar and English. The story would be poorer without either. The book is set in North-Western Australia and tells the story of a school teacher and his wife arriving to teach at an Aboriginal settlement school. Scott sketches settings unobtrusively, with no no obvious emphasis, yet the book's sense of place is vivid and engrossing. Clever, moving book. I found it really difficult to get through this book. Partially because the multiple narratives became confusing at times, but largely because overall I didn't find the story compelling enough to make it worthwhile. A beautiful book set in what I read as a fictionalized version of Kalumburu. Scott renders the full-on beauty of the north Kimberley and the complications of life on the community perfectly. The impressionist-y quality of the storytelling and the shifting voices and perspectives reflect his ambivalence about his role in the community, his relationship with stories and country, and his own Aboriginality. This is a beautifully written book in which the narrative (other than the traditional Aboriginal Welcome) begins with Billy, slowly incorporating more voices of those around him until there is a strange unity in the multitude. It is about finding one's home, while the land simultaneously rejects those who do not belong. Perhaps all that I can say against the book is that it does have some pacing issues, rushing a bit at certain points, particularly in the last few chapters. This is my favourite of Scott's works that I've read thus far. It's an intense, illuminating, challenging and beautifully written work that forces you to reflect on so many aspects of Aboriginal/Settler relations in Australia. Because of all the hype about this book I was really looking forward to reading it but instead I found it so difficult to read that I gave up after about fifty pages. I found it very confusing and frankly not interesting enough to be worthwhile trudging on with it. I really liked the way this book was written. Even from the opening page it had my attention, even though nothing was really happening.